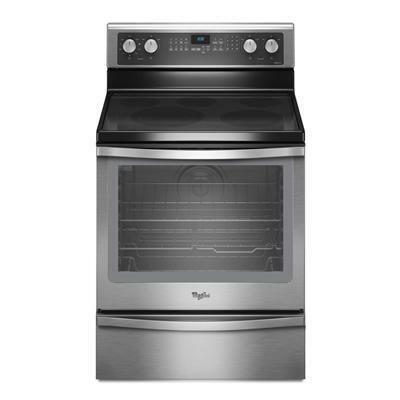 Whirlpool 6.2 cu.ft. capacity electric range with rapid preheat. The freestanding range features max capacity recessed rack, TimeSavor™ Plus true convection system, EasyView™ extra-large oven window and AquaLift™ self-clean technology. Achieve uniform baking results every time with the AccuBake® temperature management system. A built-in sensor monitors oven temperature and controls the cooking elements to deliver consistent, delicious results every time. Additional Information AccuBake® Temperature Management System. TimeSavor™ Plus True Convection Cooking System. AquaLift™ self-clean technology: AquaLift™ self-clean technology delivers easy and odor-free oven cleaning in only 50 minutes. 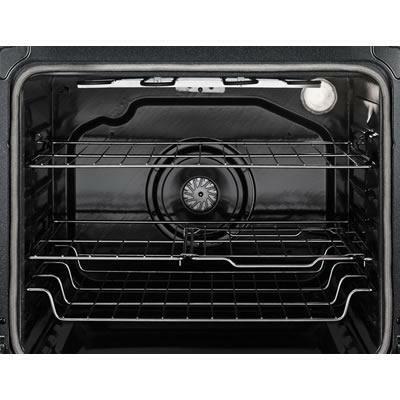 Most energy-efficient cleaning self-cleaning cycle available uses water and low-heat to release baked-on foods from the bottom of the oven. When the cleaning cycle is complete, soils and excess water can be easily removed with a dry towel. Rapid Preheat. EasyView™ extra-large oven window. 10" Rapid Boil element. 6" Warm Zone element. Split Rack. Convection Conversion. Max Capacity recessed rack. Hidden Bake Element. Burner/Element Size 12"/9"/6", 6", 6", 6", 10"